Ducks and Rats and Hawks, Oh My! Howard has been ducknapped by the Collector and stuck into his interstellar zoo — just like in his cameo from “Guardians of the Galaxy!” And sure enough, there’s Rocket Raccoon, who’s also in the hoosegow with Howard. But it’s all a cunning ruse — Rocket has a way to take over the computers, so he shuts down the forcefield around the prison planet, and the Guardians help Howard escape. But they have to leave all the other prisoners — all guilty of nothing more than being the last members of their races — stuck in the Collector’s zoo, and that doesn’t sit well with Howard, even after he makes it back to Earth. Verdict: Thumbs up. Lots of excellent and surreal jokes. A nice bit of characterization — Howard actually has a sense of justice, but he’s still just a talking duck, so he’s frustrated that he can’t do more to help others. And a wonderfully bizarre cliffhanger, too. 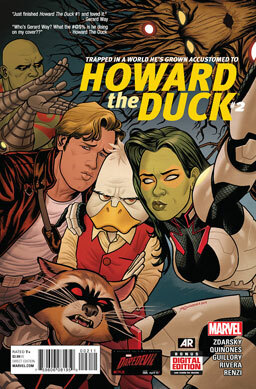 And really, it’s worth a thumbs up just for the amazing duckface cover. 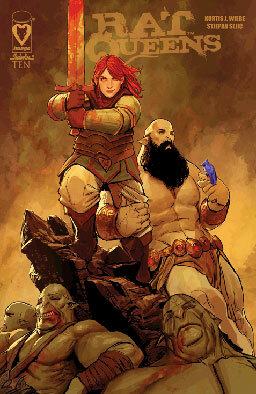 The Rat Queens and their mercenary allies continue their struggle against Gerrig, his soldiers, and the gods he’s wielding against the city. Skulls are cleaved, smooches are delivered, magic is zapped, and secrets are revealed. Can the Queens defeat ultimate evil? Verdict: Thumbs up. It’s a great action sequence almost from beginning to end, with plenty of great character moments wrapped around the whole thing. I do wish we’d gotten some kind of excellent moment for Betty, the drug-abusing halfling — she’s the only main character who doesn’t get any focus this issue. This issue is again split between a couple different stories. 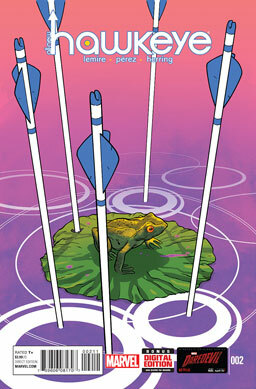 We follow Clint and Barney Barton as children as they begin their new lives with the traveling circus. And in the present, Kate Bishop and Clint Barton rescue some kids — grotesque science-experiment super-psychic kids — from A.I.M. Verdict: Thumbs up. The big winner here really is the art, which goes from gauzy, soft-focus, pastoral memories in the past to more traditional superhero penciling in the present. It’s impressive and beautiful work. Hiya, I'm Scott Slemmons. This is my comic book blog. Besides reading comics, my interests include horror fiction, heavy metal, playing the City of Heroes computer game, being a colossal pessimist, and trying in vain to find time to write. If you'd like to contact me, feel free to e-mail me here. Slay, Monstrobot of the Deep! Copyright © 2015 Hero Sandwich. Powered by WordPress and A Dream to Host theme by Art of Blog.